I've been avoiding writing about how Finley is now... GASP... 11 months old. It can't be true. I can't be one month from having a one year old human being in my care. Can't be. Refusing to accept that particular fact. The only thing I like about the impending birthday is the PARTY I get to plan. It's going to be a doozy. Finley walks around like crazy with his lion and cruises on the furniture. He hasn't really figured out how to bend his knees and his straightlegged little walk is precious. He has gotten crawling down pat--sometimes he crawls so fast he tips over. He's so cute, I like him so much. I don't think I've mentioned that before, have I? He hasn't taken a bottle in a while but he likes to drink from his sippy cup. We're trying to get him to eat more finger foods on his own, but he does a good job with the mushed up stuff I make for him. Sleeping is still going well too--he went through a few days where he refused to take an afternoon nap, but he's back on track now. Finley is a chatty kid. He loves to make new noises and practice using his voice. He babbles "mama", "dada", "baba" and a variety of other noises. And one time I think he said, "ROAR!" to his lion (he's holding it in the picture below). 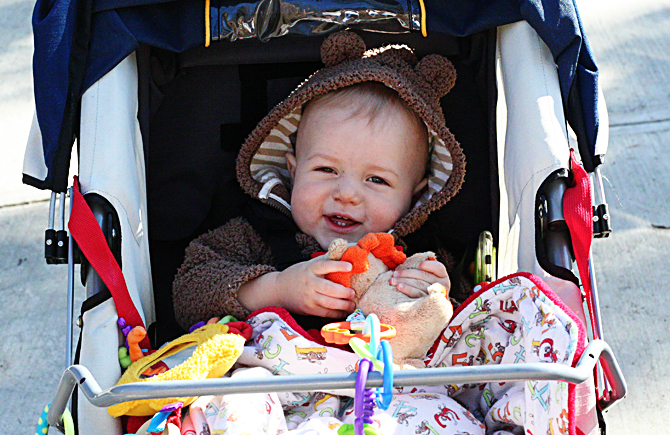 He loves to go for rides in the stroller, swing at the park and giggle at everything. We love you Finley. You are the sweetest thing we could ever have. WHOA! This must be my best blog post EVER. First comment from the husband. Love the lion. Ruthie has one too.